Create UI elements or entry points that make your add-in's functionality easier to use. Add buttons or a drop-down list of buttons to the ribbon. Add individual menu items — each containing optional submenus — to specific context (shortcut) menus. Show one or more task pane add-ins for users to interact with. Inside your task pane add-in, you can display HTML that uses Office UI Fabric to create a custom UI. This article describes how to edit your manifest to define add-in commands. The following diagram shows the hierarchy of elements used to define add-in commands. These elements are described in more detail in this article. The following image is an overview of add-in commands elements in the manifest. We strongly recommend that you start from one of the samples we provide in Office Add-in Commands Samples. Optionally, you can create your own manifest by following the steps in this guide. You can validate your manifest using the XSD file in the Office Add-in Commands Samples site. Ensure that you have read Add-in commands for Excel, Word and PowerPoint before using add-in commands. To start using add-in commands, you must first create a task pane add-in, and then modify the add-in's manifest as described in this article. You can't use add-in commands with content add-ins. If you're updating an existing manifest, you must add the appropiate XML namespaces as well as add the VersionOverrides element to the manifest as described in Step 3: Add VersionOverrides element. The following example shows an Office 2013 add-in's manifest. There are no add-in commands in this manifest because there is no VersionOverrides element. Office 2013 doesn't support add-in commands, but by adding VersionOverrides to this manifest, your add-in will run in both Office 2013 and Office 2016. In Office 2013, your add-in won't display add-in commands, and uses the value of SourceLocation to run your add-in as a single task pane add-in. In Office 2016, if no VersionOverrides element is included, SourceLocation is used to run your add-in. If you include VersionOverrides, however, your add-in displays the add-in commands only, and doesn't display your add-in as a single task pane add-in. The VersionOverrides element is the root element that contains the definition of your add-in command. 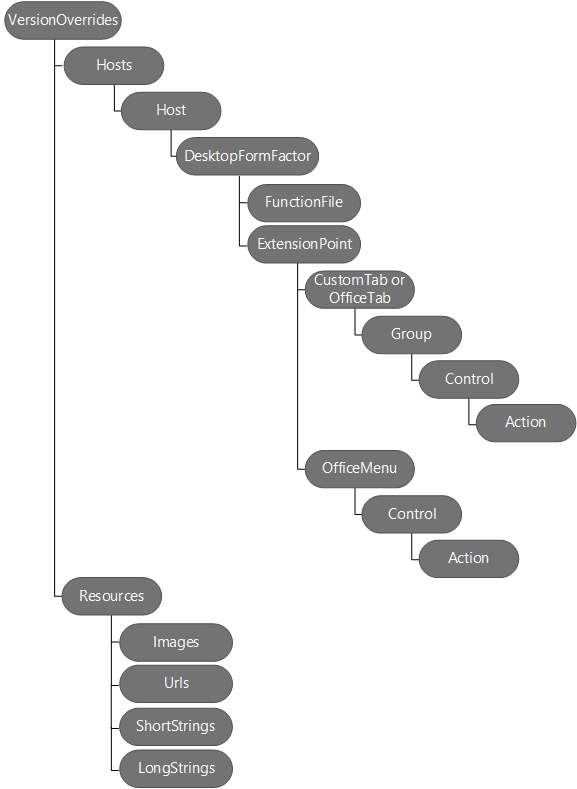 VersionOverrides is a child element of the OfficeApp element in the manifest. The following table lists the attributes of the VersionOverrides element. Required. The schema location, which must be http://schemas.microsoft.com/office/taskpaneappversionoverrides. Required. The schema version. The version described in this article is "VersionOverridesV1_0". The following table identifies the child elements of VersionOverrides. Optional. Describes the add-in. This child Description element overrides a previous Description element in the parent portion of the manifest. The resid attribute for this Description element is set to the id of a String element. The String element contains the text for Description. Optional. Specifies the minimum requirement set and version of Office.js that the add-in requires. This child Requirements element overrides the Requirements element in the parent portion of the manifest. For more information, see Specify Office hosts and API requirements. Required. Specifies a collection of Office hosts. The child Hosts element overrides the Hosts element in the parent portion of the manifest. You must include a xsi:type attribute set to "Workbook" or "Document". Defines a collection of resources (strings, URLs, and images) that other manifest elements reference. For example, the Description element's value refers to a child element in Resources. The Resources element is described in Step 7: Add the Resources element later in this article. The following example shows how to use the VersionOverrides element and its child elements. The Hosts element contains one or more Host elements. A Host element specifies a particular Office host. The Host element contains child elements that specify the add-in commands to display after your add-in is installed in that Office host. To show the same add-in commands in two or more different Office hosts, you must duplicate the child elements in each Host. The DesktopFormFactor element specifies the settings for an add-in that runs in Office on Windows desktop, and Office Online (in browser). The following is an example of Hosts, Host, and DesktopFormFactor elements. The following is an example of the FunctionFile element. The following code shows how to implement the function used by FunctionName. // The initialize function must be run each time a new page is loaded. // If you need to initialize something you can do so here. // Your function must be in the global namespace. // Implement your custom code here. The following code is a simple example. // Calling event.completed is required. event.completed lets the platform know that processing has completed. The call to event.completed signals that you have successfully handled the event. When a function is called multiple times, such as multiple clicks on the same add-in command, all events are automatically queued. The first event runs automatically, while the other events remain on the queue. When your function calls event.completed, the next queued call to that function runs. You must implement event.completed, otherwise your function will not run. PrimaryCommandSurface, which refers to the ribbon in Office. ContextMenu, which is the shortcut menu that appears when you right-click in the Office UI. The following examples show how to use the ExtensionPoint element with PrimaryCommandSurface and ContextMenu attribute values, and the child elements that should be used with each. For elements that contain an ID attribute, make sure you provide a unique ID. We recommend that you use your company's name along with your ID. For example, use the following format: <CustomTab id="mycompanyname.mygroupname">. Required if you want to add a custom tab to the ribbon (using PrimaryCommandSurface). If you use the CustomTab element, you can't use the OfficeTab element. The id attribute is required. Required if you want to extend a default Office ribbon tab (using PrimaryCommandSurface). If you use the OfficeTab element, you can't use the CustomTab element. For more tab values to use with the id attribute, see Tab values for default Office ribbon tabs. ContextMenuText for Excel or Word. Displays the item on the context menu when text is selected and then the user right-clicks on the selected text. ContextMenuCell for Excel. Displays the item on the context menu when the user right-clicks on a cell on the spreadsheet. A group of user interface extension points on a tab. A group can have up to six controls. The id attribute is required. It's a string with a maximum of 125 characters. Required. The label of the group. The resid attribute must be set to the value of the id attribute of a String element. The String element is a child element of the ShortStrings element, which is a child element of the Resources element. Required. Specifies the group's icon to be used on small form factor devices, or when too many buttons are displayed. The resid attribute must be set to the value of the id attribute of an Image element. The Image element is a child element of the Images element, which is a child element of the Resources element. The size attribute gives the size, in pixels, of the image. Three image sizes are required: 16, 32, and 80. Five optional sizes are also supported: 20, 24, 40, 48, and 64. Optional. The tooltip of the group. The resid attribute must be set to the value of the id attribute of a String element. The String element is a child element of the LongStrings element, which is a child element of the Resources element. Each group requires at least one control. A Control element can be either a Button or a Menu. Use Menu to specify a drop-down list of button controls. Currently, only buttons and menus are supported. See the Button controls and Menu controls sections for more information. Note: To make troubleshooting easier, we recommend that you add a Control element and the related Resources child elements one at a time. The type attribute is required, and must be set to Button. The id attribute of the Control element is a string with a maximum of 125 characters. Required. The text for the button. The resid attribute must be set to the value of the id attribute of a String element. The String element is a child element of the ShortStrings element, which is a child element of the Resources element. Optional. The tooltip for the button. The resid attribute must be set to the value of the id attribute of a String element. The String element is a child element of the LongStrings element, which is a child element of the Resources element. Required. The text for the supertip. The resid attribute must be set to the value of the id attribute of a String element. The String element is a child element of the ShortStrings element, which is a child element of the Resources element. Required. The description for the supertip. The resid attribute must be set to the value of the id attribute of a String element. The String element is a child element of the LongStrings element, which is a child element of the Resources element. Required. Contains the Image elements for the button. Image files must be .png format. Defines an image to display on the button. The resid attribute must be set to the value of the id attribute of an Image element. The Image element is a child element of the Images element, which is a child element of the Resources element. The size attribute indicates the size, in pixels, of the image. Three image sizes are required: 16, 32, and 80. Five optional sizes are also supported: 20, 24, 40, 48, and 64. ShowTaskPane, which shows a task pane add-in. The SourceLocation child element specifies the source file location of the task pane add-in to display. The resid attribute must be set to the value of the id attribute of a Url element in the Urls element in the Resources element. A list of submenu items. The xsi:type attribute is required, and must be set to Menu. The id attribute is a string with a maximum of 125 characters. Required. The text of the root menu item. The resid attribute must be set to the value of the id attribute of a String element. The String element is a child element of the ShortStrings element, which is a child element of the Resources element. Optional. The tooltip for the menu. The resid attribute must be set to the value of the id attribute of a String element. The String element is a child element of the LongStrings element, which is a child element of the Resources element. Required. The text of the supertip. The resid attribute must be set to the value of the id attribute of a String element. The String element is a child element of the ShortStrings element, which is a child element of the Resources element. Required. Contains the Image elements for the menu. Image files must be .png format. An image for the menu. The resid attribute must be set to the value of the id attribute of an Image element. The Image element is a child element of the Images element, which is a child element of the Resources element. The size attribute indicates the size in pixels of the image. Three image sizes, in pixels, are required: 16, 32, and 80. Five optional sizes, in pixels, are also supported: 20, 24, 40, 48, and 64. Required. Contains the Item elements for each submenu item. Each Item element contains the same child elements as Button controls. The Resources element contains resources used by the different child elements of the VersionOverrides element. Resources include icons, strings, and URLs. An element in the manifest can use a resource by referencing the id of the resource. Using the id helps organize the manifest, especially when there are different versions of the resource for different locales. An id has a maximum of 32 characters. The following shows an example of how to use the Resources element. Each resource can have one or more Override child elements to define a different resource for a specific locale. Provides an HTTPS URL location. A URL can be a maximum of 2048 characters. The text for Label and Title elements. Each String contains a maximum of 125 characters. The text for Tooltip and Description elements. Each String contains a maximum of 250 characters. You must use Secure Sockets Layer (SSL) for all URLs in the Image and Url elements. In Excel and Word, you can add your add-in commands to the ribbon by using the default Office UI tabs. The following table lists the values that you can use for the id attribute of the OfficeTab element. The tab values are case sensitive.